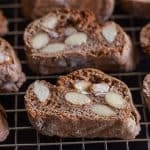 Chocolate Almond Biscotti, also known as Cantucci, a twice baked Italian cookie, this traditional Italian Chocolate Cookie is made with whole roasted almonds. A definite holiday treat. a special treat in our house, always made during the Christmas season. I have been perfecting these Almond Biscotti for awhile now, the first few batches I made with butter and no honey, one completely fell apart after the first bake and one batch I was so fed up with, I made it into one big log. But then after having a couple of conversations with some of my Italian family members and friends I discovered that true biscotti has no butter and yes a teaspoon or two of honey is recommended. Did you know that honey gives these Cantucci the crunchiness that they are famous for. More honey more crunchiness. But I think a teaspoon or a teaspoon and a half is all you really need. Our friend told us that when his father made them he would add so much honey that they would almost break your teeth. That I don’t need. These biscuits originated from Prato a city in Tuscany, and are usually served with an Italian Dessert wine, called Vin Santo. But we like them dipped in regular wine or a strong espresso. Or why not dip them in some melted chocolate and call them Double Chocolate Biscotti! More Chocolate Desserts you may enjoy! 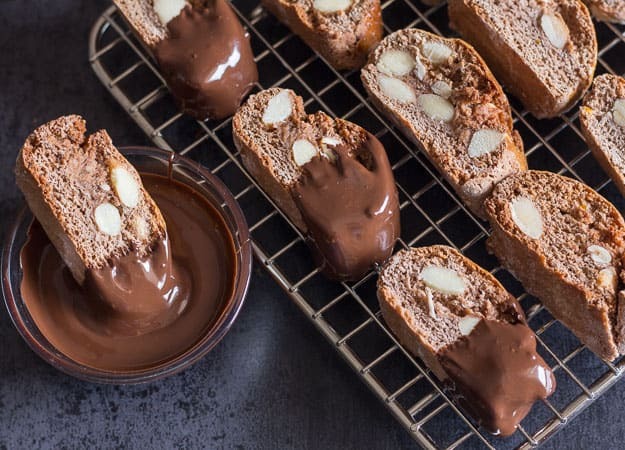 What you will need to make these Delicious Chocolate Almond Biscotti. Wire Rack – When making cookies a wire rack is must have. Hand Beater – This is something I use constantly. Nothing like a good hand beater. Pastry Brush – Perfect for brushing on an egg wash or milk. Honey – A must ingredient in Biscotti. 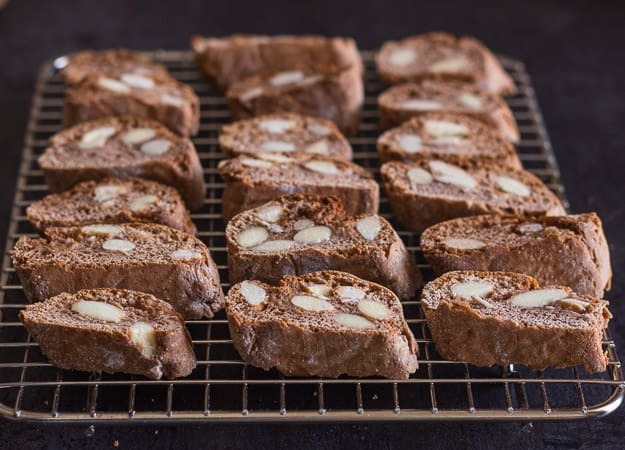 Whether you call these Traditional Italian Chocolate Almond Biscotti, Cantucci or Biscotti, I think you will find them very tasty and so easy to make. They are a perfectly delicious addition to your holiday baking. Enjoy! 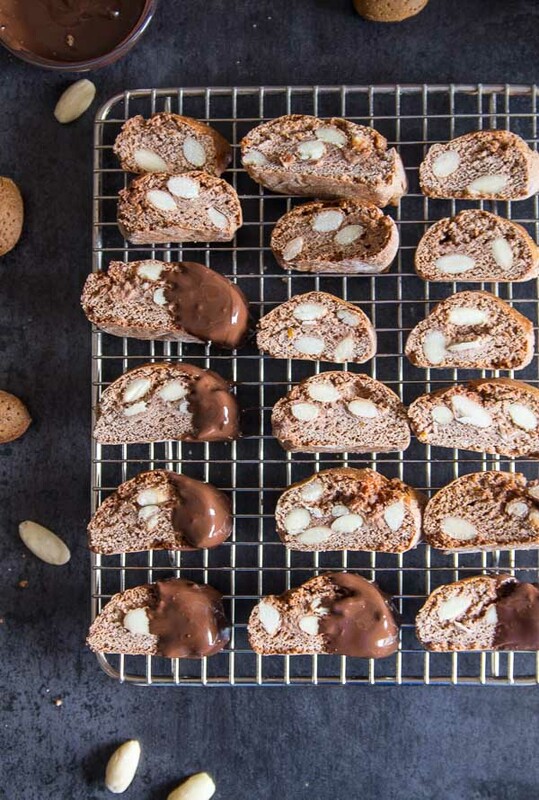 Chocolate Almond Biscotti, an Traditional Italian chocolate cookie, made with roasted almonds and honey. The perfect holiday cookie. On an unlined cookie sheet toast almonds for approximately 5 minutes in the pre-heated oven. Remove from oven, move to a small bowl and let cool. 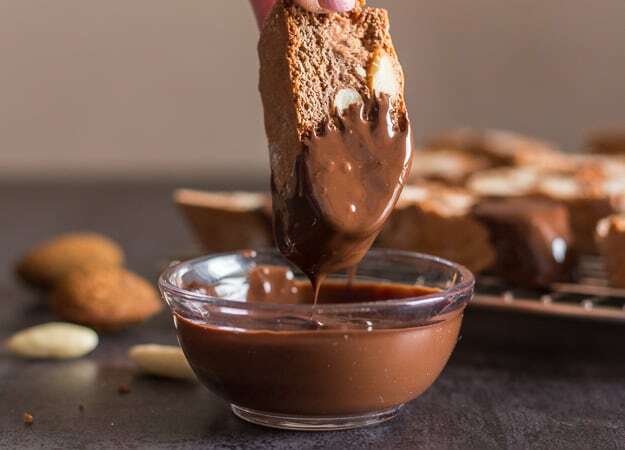 In a medium bowl beat eggs and sugar to combine, then add flour, cocoa, salt, baking powder, honey, vanilla and zest and combine with a wooden spoon, then fold in the almonds. 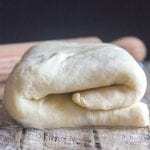 Move to a lightly floured flat surface and gently knead into a soft dough. Divide into 2-3 parts and form into 2-3 logs (I found 3 logs to be just right). 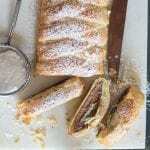 Approximately 8-10 inches long, place on prepared cookie sheet and brush with beaten egg (a small egg), bake for approximately 20 minutes. 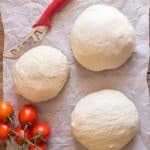 Remove from oven, let sit 5 minutes and then cut each log into 1/4 inch slices on the diagonal, place cut side up on the cookie sheet and bake again for approximately 5-10 minutes or until dry. Let cool completely before dipping in melted chocolate. Enjoy! I am a participant in the Amazon Services LLC Associates Program, an affiliate advertising program designed to provide a means for me to earn fees by advertising and linking to Amazon.com. 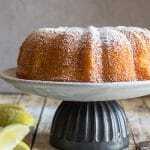 I tried this recipe and distributed to my housemates and everyone was very pleased! The flavours are delicious and the texture is perfect! They were also very easy to make and didn’t take nearly as long as some other biscotti recipes! Next time I might make two loaves instead of 3 to get bigger pieces but these were a good size for dunking in a hot drink. Thank you for the recipe! Hi Emily, thanks so much so glad everyone like them. Have a great weekend.